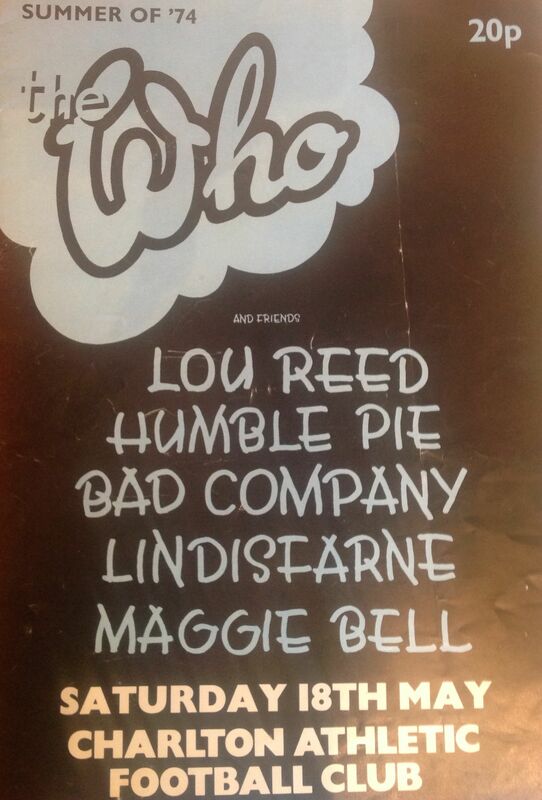 Support Acts, in order of appearance: Montrose, Lindisfarne, Bad Company, Lou Reed, Humble Pie, Maggie Bell. The support acts were chosen by The Who. The Who spent some time considering venues for a big outdoor London concert, and selected Charlton ground because, accordingly to Townshend, it had “particular acoustic qualities” and offered “excellent views of the stage from the terraces.” I went to the gig with two mates, travelling down to London by coach, leaving the north east at midnight on Friday night and arriving early on Saturday morning. We then caught the local train across to Charlton. By the time we arrived the ground was pretty full, and fans continued to flood in throughout the morning. By the time Montrose exploded onto the stage at 12 noon, the place was ram packed. The concert was intended to have an attendance limit of 50,000 fans, but breakdowns in security resulted in many additional people getting in, and an estimated crowd of 80,000 (The Complete Chronicle of the Who 1958-1978, Neill & Kent, 2007). I ran into quite a few mates from home on the terraces, several of whom had managed to push or blag their way in without paying. 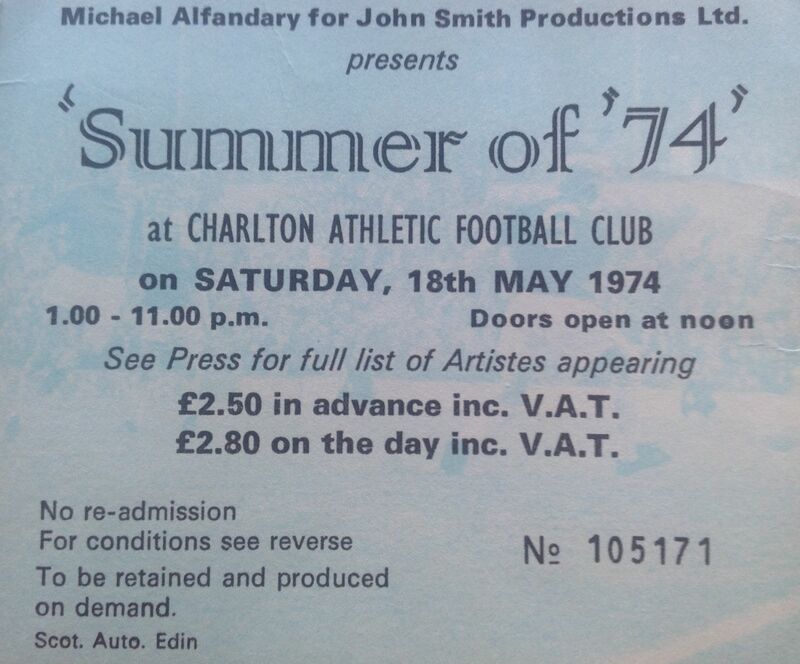 The supporting bill was very strong, with Montrose and Bad Company both going down well. 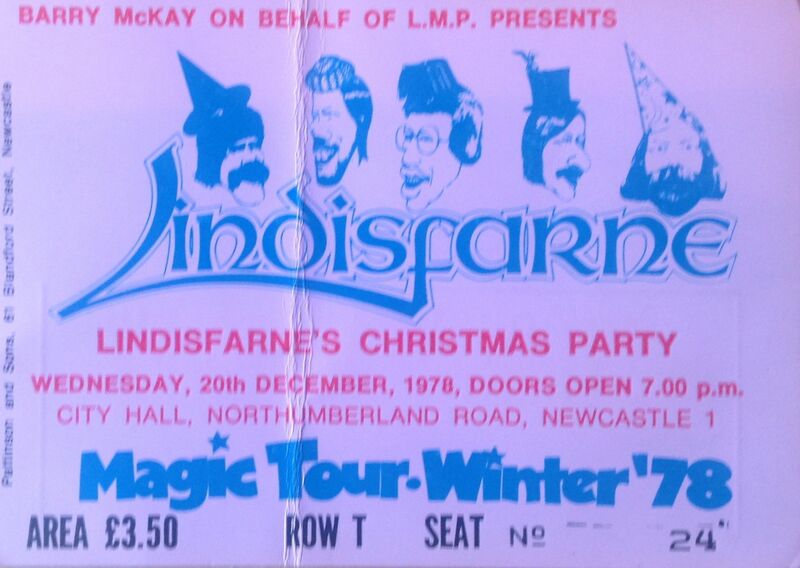 This was one of the first appearances of the new Lindisfarne Mk II line-up. Lou Reed and Maggie Bell both played ok, but didn’t go down as well with the crowd as the others. Humble Pie were pure class, with Marriott on his top OTT “my skin is white, but my soul is black” form. They almost upstaged the main act. There was a long wait before The Who took to the stage, and several reports recall an atmosphere of violence, which I must say I don’t remember. I do remember that it was a very hot day and that there were some fights, a heavy smell of dope with many people openly smoking joints, and lots of cans thrown around throughout the day. 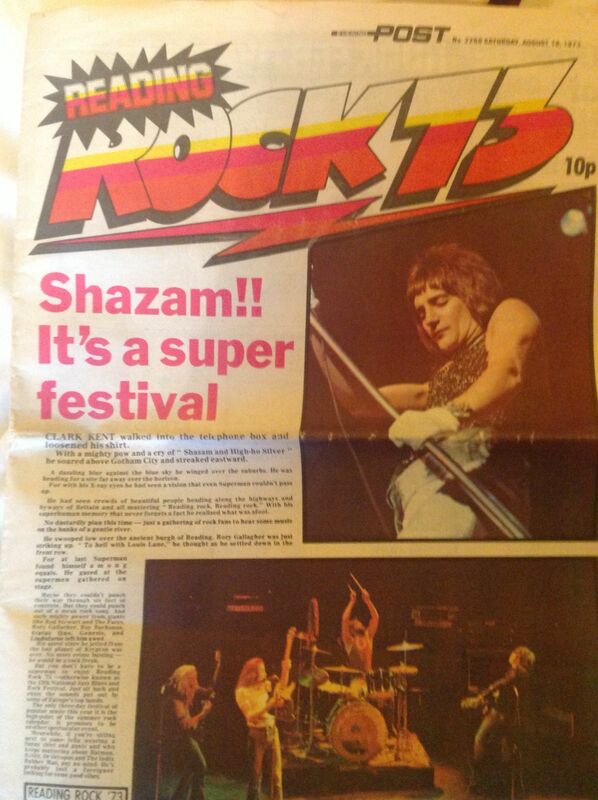 Brian Farnon writes of a “lunatic…wandering around with a foot-long spike….sticking it in peoples necks” on the excellent ukrockfestivals.com site. The Who started at 8:45 and played an hour and 45 minute set, starting with “Can’t Explain” and working their way through old classics and some more recent material, including a few from their most recent album “Quadrophenia”. The sound wasn’t that great, even though we had been promised quadrophonic sound, and there were large PA speakers sited around the ground. The Who were excellent, although Pete later admitted that he was drunk and felt that the show wasn’t actually one of their best. To all of us in the crowd it was a great day, and an opportunity to see the best rock band in the world during their prime period. The set included a lot of 60s material, and several songs that I hadn’t seen them play before such as “I’m a Boy” and “Tattoo”. Entwistle performed “Boris the Spider” in his deep bass voice. A lengthy encore included “5:15”, an extended “Magic Bus”, “My Generation”, “Naked Eye”, “Let’s See Action” and the first ever performance of their slow 12-bar blues arrangement of “My Generation”, which is now known as “My Generation Blues”. Pete didn’t smash his guitar. This was the year punk finally arrived. 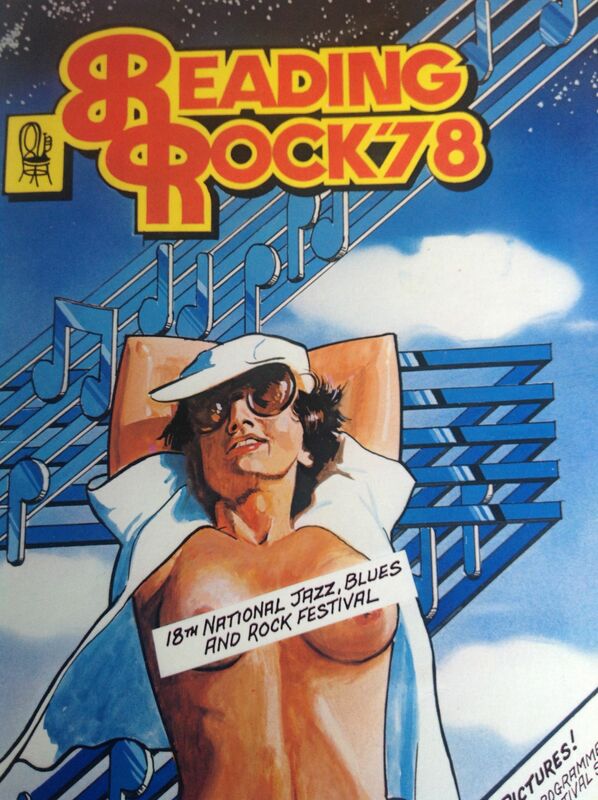 The festival was now officially known as the Reading Rock Festival, having dropped “jazz” from the title and the line-up, and weekend tickets cost all of £8.95. Our old friend John Peel was compere, as always, and a van load of us descended on the riverside site, having driven part of the way down on Thursday, gone for a drink in Wetherby and slept on Wetherby racecourse (the crazy things you do when you are young 🙂 ) Highlights of the weekend for me were Penetration (I was a big fan at the time), Sham 69, The Jam, Status Quo (most of our group were heavily into them) and Patti Smith. Friday line-up: Dennis O’Brien; The Automatics; New Hearts (who would become mods and change their name to Secret Affair); Radio Stars; Penetration; Sham 69; The Pirates; Ultravox; The Jam. Memories: Radio Stars were always good for a laugh; “Dirty Pictures” (turn me on) was a favourite at the time; it was great to see local north east punk heroes playing up on the massive Reading stage Penetration, although they suffered from murky sound throughout their set; The Pirates rocked the place with no-nonsense rock’n’roll, “Shaking All Over” and ace guitarist the late Mick Green (a big influence on Wilko); and the John Foxx version of Ultravox! played a quite moody atmospheric electronic set. The main event was Sham 69, who were excellent with Jimmy Pursey his usual cockney “boy on the streets” self, and those anthems “What have we got?”, “Borstal Breakout” and “If the Kids are United”. The Sham Army had come across to Reading in force, all braces, No 2 cuts, and Doc Martins, and ready to take on those hippies. We were right at the front, although we soon moved to the side of the crowd when the fights started. A bunch of skins climbed on to the stage, and Pursey tried to call order, pleading with the crowd to stop fighting to no avail. He was in tears, watching bedlam and violence all around him, and not being able to do anything to stop it. But that was the nature of a Sham gig at the time. Jimmy even brought Steve Hillage on stage to show that it was ok to mix with hippies, but that just annoyed the skins more. A nasty, frightening experience, which marred an excellent performance by Sham. The Jam were great, Weller the edgy young mod, getting himself into a strop at the poor sound quality, and trashing his gear. Punk really had arrived at Reading. Saturday line-up: Speedometors; The Business; Jenny Darren; Next; Gruppo Sportivo; Nutz; Greg Kihn Band; Lindisfarne; Spirit; The Motors; Status Quo. Saturday was a little more straightforward rock. 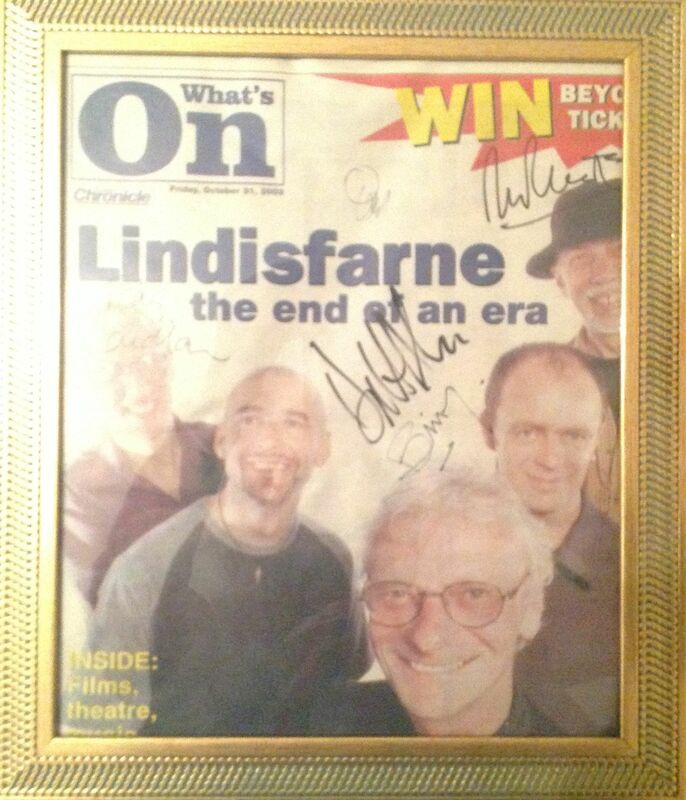 Lindisfarne had recently reunited and hit the charts with “Run For Home”. The Motors were OK (Airport!). Spirit were excellent, with great Hendrix-style guitar from Randy California. Status Quo played a solid respectable set, nothing earth shattering. I know quite a few people were disappointed with them that night, but I thought they were OK. “Dirty Water’ was to become a crowd singalong favourite. Status Quo setlist: Caroline; Roll Over Lay Down; Backwater; Rockers Rollin; Is There A Better Way; You Don’t Own Me; Hold You Back; Rockin All Over The World; Dirty Water; 4500 Times; Big Fat Mama; Don’t Waste My Time; Roadhouse Blues; Rain; Down Down; Bye Bye Johnny. Sunday line-up: After The Fire; Chelsea; Pacific Eardrum; Bethnal; Squeeze; John Otway; The Albion Band; Paul Inder; Ian Gillan Band; Tom Robinson Band; Foreigner; Patti Smith Group. Memories: Paul Inder is Lemmy’s son and was 11 years old (!) 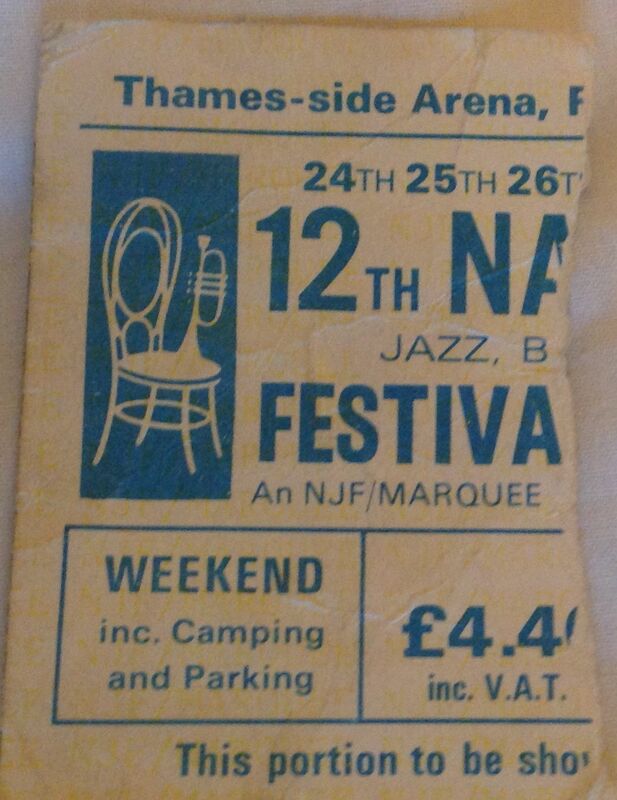 at the time; what a great thing to do when you are 11 🙂 ; Bethnal were a good band, who had a manic violin player; Squeeze were fun; Otway was as crazy as ever (Really Free); Tom Robinson led a mass singalong of “Glad to be Gay”; and Foreigner went down well with the crowd. But the day belonged to Patti Smith who was amazing. I was a big fan and left my mates to push my way right to the front of the crowd for Patti’s set. She had the whole crowd with her as she tore into “Gloria”, “Because the Night” and great covers of the Byrds’ “So You Want to Be (A Rock ‘N’ Roll Star)” and the Who’s “My Generation”. Stunning. I saw her again at Newcastle City Hall two days later and she was equally as electric. 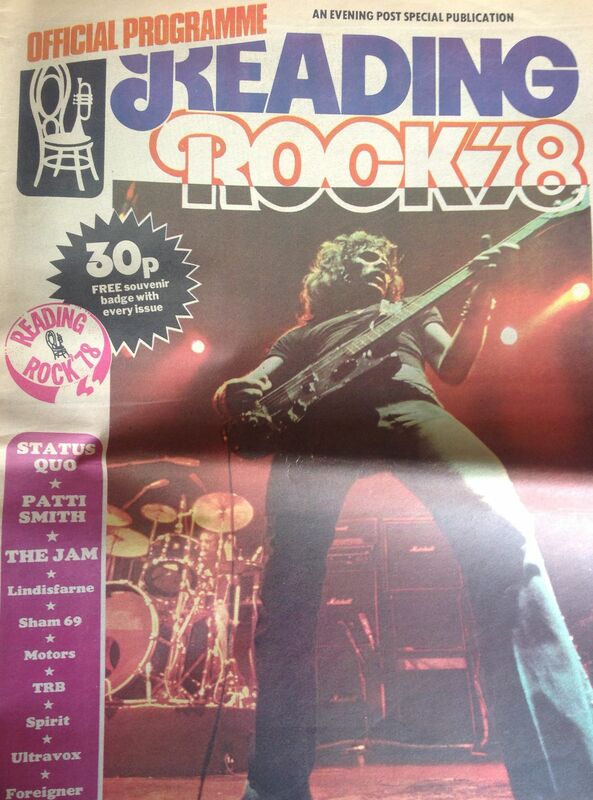 August 1973 and I was back at the Reading Festival. This year I hooked up with a large group of mates from town who had traveled down in a Transit van. I discovered Reading town centre, and the local pubs for the first time this year, and as a result missed some of the bands. The line-up was pretty mixed, with a clear attempt to become international; featuring bands from France, Italy and the USA, and also retaining jazz elements with appearances by Chris Barber and George Melly (who was great and a surprise success). Friday line-up: Embryo (Germany), Alquin (Holland), Stray Dog (USA), Greenslade, Capability Brown, Commander Cody and the Lost Planet Airmen (USA), Jo’Burg Hawk (South Africa), Rory Gallagher. The successes of the day were Commander Cody and of course Rory, who was just amazing. This was classic Rory at his best: Messin’ With the Kid; Laundromat; Walk on Hot Coals; Pistol Slapper Blues; Going to My Home Town; and Bullfrog Blues. The crowd loved him. Capability Brown grew out of the ’60s band Harmony Grass; prog rock with great harmonies. The other thing I discovered was the bridge over the Thames, and we spent many an hour watching people dive off and down into the river (which seemed crazy and dangerous to me). Saturday line-up: Dave Ellis, Clare Hamill, Tasavallan Presidentti (Finland), Riff Raff, Fumble, Magma (France), Lindisfarne (Mk II), Chris Barber band, Status Quo, Sensation Alex Harvey Band, Strider, Andy Bown, The Faces. My memories of the Saturday are of Status Quo going down a storm, and the Faces being OK, but the real success of the day being the Sensation Alex Harvey Band. SAHB were just about to release “Next”; I think they started the set with “Faith Healer” which sounded incredible, the intro throbbing across the field. Alex was electric and made a lot of new friends that day. The Faces set was nowhere near as strong as the previous year. This was one of their first gigs after Ronnie Lane had been replaced by Tetsu (who was great by the way); you could sense that the band were losing their enthusiasm and a Rod would soon be on his way. Lots of footballs into the crowd again. Oh and Jesus dancing naked during the afternoon. I don’t recall Andy Bown’s set and didn’t know much about him at the time, other than he was in The Herd with Peter Frampton. I do remember being surprised as how high up on the bill he was. I think this was where he made friends with Quo; he joined them shortly afterwards on keyboards. Fumble were a rock’n’roll revival band who played a lot of gigs at the time; I recall seeing them several times at local student union dances. Sunday line-up: Aj Webber, John Martyn and Danny Thompson, Ange (France), Tim Hardin and Lesley Duncan with the Tim Horovitz Orchestra, PFM (Italy), Jack the Lad, Medicine Head, Stackridge, George Melly and the Feetwarmers, Jon Hiseman’s Tempest, Mahatma, Jimmy Witherspoon (USA), Spencer Davis, Genesis. I think Roy Buchanan may have played also; he was advertised in early flyers, but doesn’t feature in the programme; I think I recall watching him. The stand-outs on Sunday were (surprisingly) George Melly who wore an incredibly sharp suit and totally engaged the crowd with his crazy jazz campness, and of course Genesis, with Peter Gabriel appearing with a strange pyramid arrangement on his head. Stackridge were good as always (Slark still a favourite of mine); Spencer Davis played all the hits, and had a great band featuring Charlie McCracken, Pete York, Ray Fenwick and Eddie Hardin. Tim Hardin sang his beautiful moving songs (If I was a Carpenter, Reason to Believe) and John Martyn went down well in his early slot, accompanied by the excellent Danny Thompson on double bass. The weather was pretty good as I recall, I don’t think we got much, if any, rain. 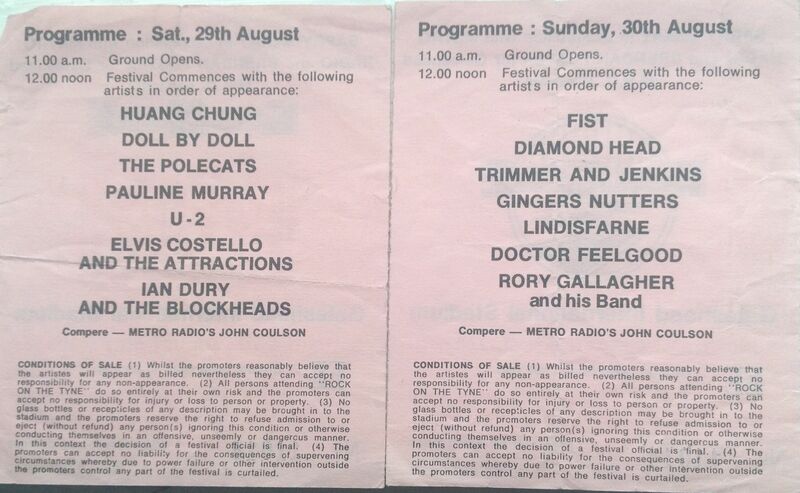 Not one of the strongest Reading line-ups, but still a good weekend of music and fun, with excellent performances by Rory, George Melly, Alex Harvey, Quo and Genesis. 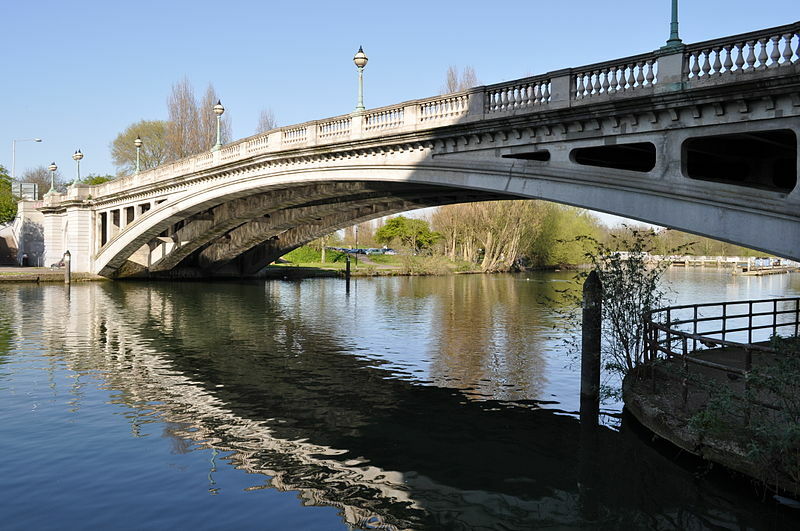 Thanks to Ben Sutherland for making his photograph of the Reading Bridge available through WikiMedia Commons. The programme was once again produced by the local newspaper and cost all of 10p 🙂 . 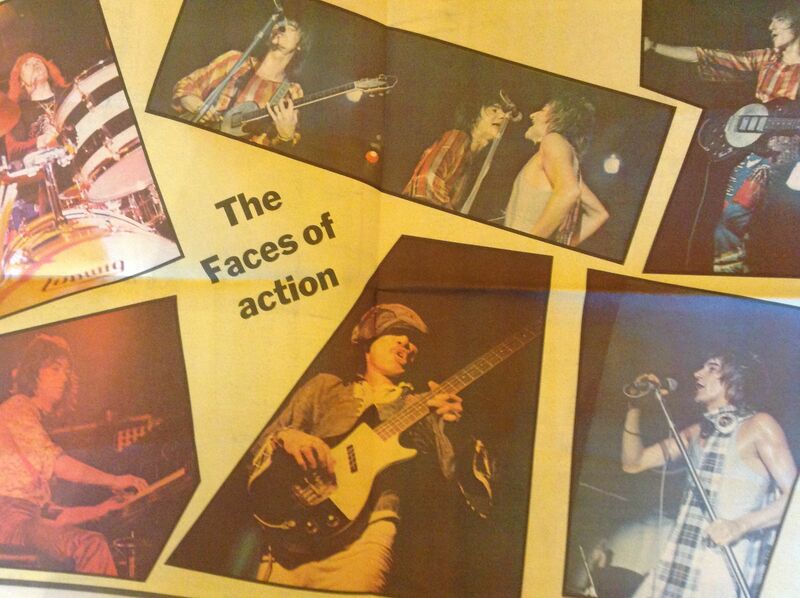 The poster of the Faces comes from the centrepages of the programme. When this show was announced, it sounded pretty improbable to me, and I just wasn’t sure that it would work. We’d been too long without a version of Lindisfarne gracing our stages, and the legendary Christmas concerts were now distant memories. But a version of Lindisfarne featuring only one original member? What would that be like? A few events led to this year’s concert. Along the way we’ve had: the Alan Hull memorial concert; the unveiling of a plaque in Alan’s memory outside the City Hall, (with Ray Jackson playing at both events); the threatened closure of the City Hall, which was seen as a call to arms by many local musicians; and Ray Laidlaw and Billy Mitchell performing The Lindisfarne Story (a show which I missed and really must try to see when it tours again next year). And then in May this year it all came together. 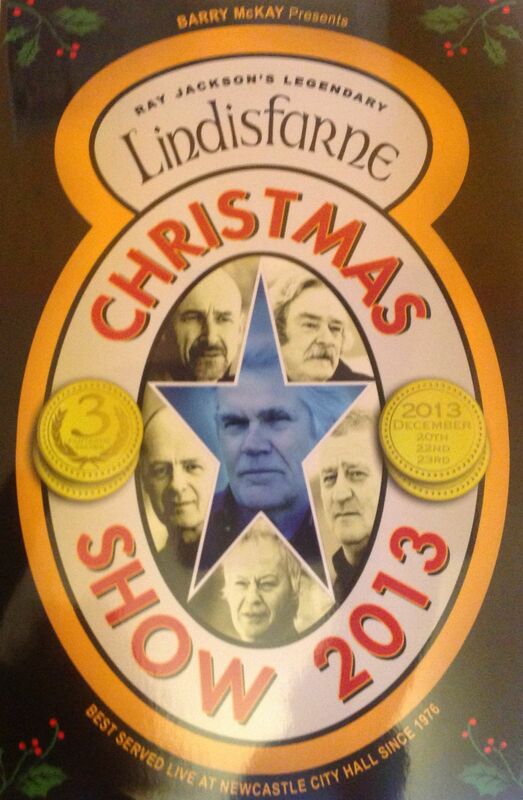 The press release at the time read: “A new Lindisfarne debuts this Christmas. Ray Jackson, whose unique mandolin, harmonica and vocal styles helped create the original sound of Lindisfarne in the 1970s, is back, and will be performing live in concert with his new band for the first time this Christmas. 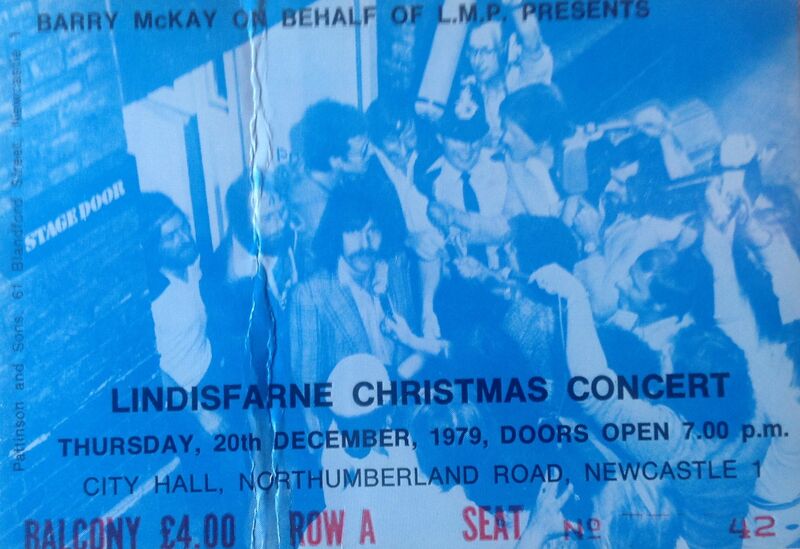 Earlier this year a date for Ray Jackson’s Legendary Lindisfarne Christmas Show was announced……Jacka’s first Lindisfarne show for 23 years! After originally only intending to perform a single show at Newcastle City Hall on December 23rd 2013, (which sold out within hours of being announced), a 2nd show was added for December 22nd, also long since sold out. A 3rd and final Newcastle show has been added for December 20th, along with three others in Harrogate, Hull and Middlesbrough”. So the Jacka Man had taken up the challenge; supported, and no doubt encouraged, by Barry McKay, Lindisfarne manager from the 70s, and promoter of the original Christmas Concerts. 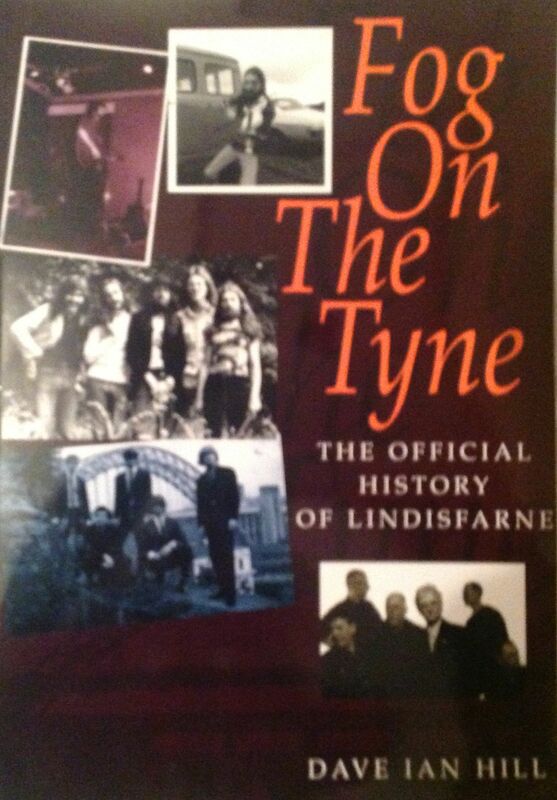 Ray Jackson’s Lindisfarne are: Ray Jackson (founder member, on mandolin/harmonica/lead vocals), Dave Hull-Denholm (from the 1990’s Lindisfarne line-up, on guitars/lead vocals), Paul Thompson (from Roxy Music, on drums), Ian Thomson from the 1990’s Lindisfarne line-up, on bass guitar/double bass/vocals), Charlie Harcourt from Lindisfarne Mk 2, on guitars/vocals) and Steve Daggett (who toured and recorded with the reformed 1978 original line-up, on guitars/keyboards/vocals). For the concerts they were also joined by Tom Leary on fiddle. As we entered the City Hall we were all given a party hat (David and I passed, both being Scrooges 🙂 ) and a free programme (donations were taken for charity). The packed out hall was greeted by Denny Ferguson as Santa (he warmed the crowd up well, but I was hoping for Mike the Mouth Elliott) and the atmosphere was friendly and high in anticipation. People were sitting up at the back of the stage behind the band, just like we did in the old days, and a huge Christmas tree stood in the corner. As soon as the new line-up started playing it was obvious that it was going to be a good night. The band recreated the Lindisfarne wall of sound and were true to their legacy and the band’s spirit, with Jacka, of course, being the star of the night. The show was in two parts, with most of the well known songs held for the last lap. The first set was something like this (from memory, and I will no doubt have missed some): Road to Kingdom Come, All Fall Down, Wake Up Little Sister, Scarecrow Song, City Song, Together Forever, Marshall Riley’s Army, Lady Eleanor (as haunting as ever), Court in the Act. The second set had everyone singing along to: Turn a Deaf Ear, Kings Cross Blues, Train in G Major, Uncle Sam, January Song, a beautiful Winter Song with Dave Hull-Denholm sounding uncannily like his father-in-law, Fog On The Tyne, We Can Swing Together (complete with a lengthy harmonica solo from Jacka including The Blaydon Races and the Theme from Z Cars (boo..) and just as I remember it from the 70s, and….an appearance by the High Spen Blue Diamonds Sword Dancers), Run For Home and closing with Meet Me On The Corner. The encore was: Roxy’s (or actually Canned Heat’s) Lets Work Together (a surprise and well played with lots of great harmonica from Jacka) and (of course, to send us home on our way) a great singalong to Clear White Light. 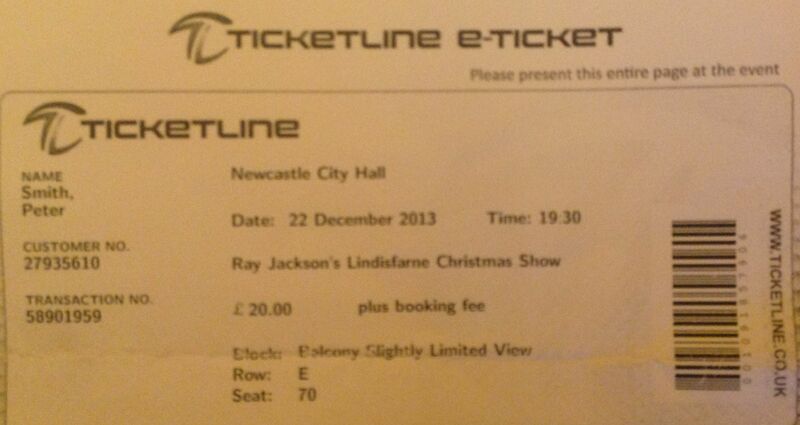 Barry McKay said something about next year’s present being even better; could that hint at a Lindisfarne reunion? Rod Clements was in the audience last night, so who knows. 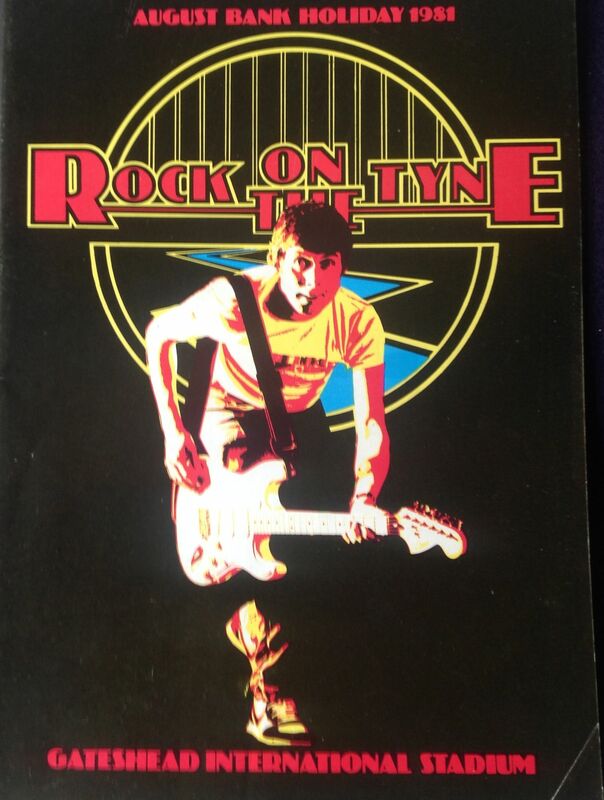 A great night which reclaimed Newcastle’s Christmas for a legendary band, without tarnishing any memories, and gave a few thousands Geordies an early present. Well done and many thanks to Jacka. 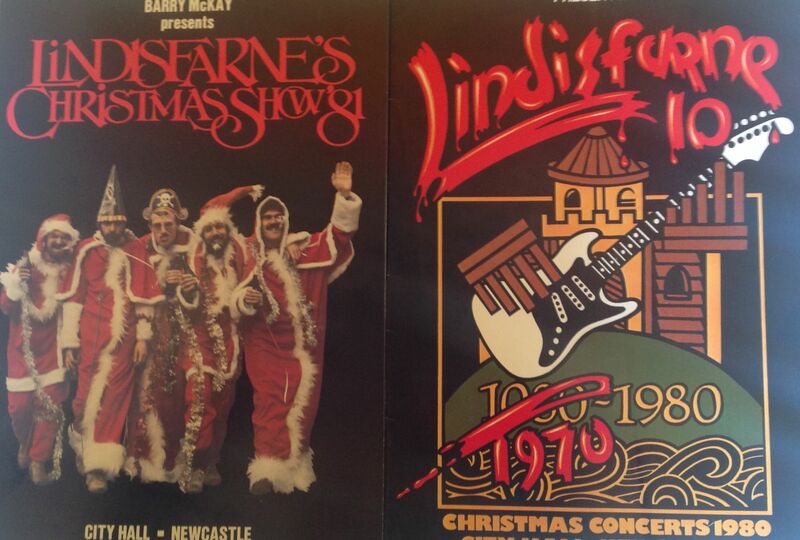 Sadly Lindisfarne went off my radar from the mid-80s onwards. I’d lost faith in the band, and my concert going activities had also declined a little for work and family reasons. However, I still kept an eye on what the guys were doing and how the line-up changed over the years, but I never felt the need to go and see them in concert. Suddenly I read that they were to fold. This was announced during their Autumn 2003 tour, which was due to end with a concert on 1 November 2003 at the Newcastle Opera House. The final line up included Dave Hull-Denholm, Billy Mitchell, Rod Clements, Ian Thomson and Ray Laidlaw. The break-up was announced at quite short notice, and by the time I found out the Newcastle concert was understandably completely sold out. I realised that there weren’t going to be any more chances to see the band, and felt I had to attend a Lindisfarne concert one more time. At first I planned to go along to the Opera House on the night of the concert and attempt to buy a ticket outside. However, I figured that this might not be easy, and that it could also be very expensive, so when I learnt that tickets were still on sale for their concert the night before in Carlisle, I decided to take the next best (and easier and probably cheaper) option and drive across to see them in Cumbria. 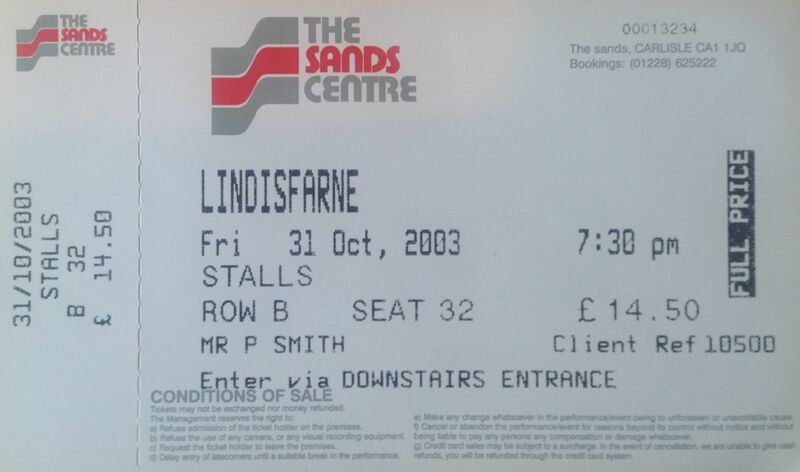 So, almost 20 years since I last attended a Lindisfarne concert, I saw their penultimate gig at Carlisle Sands Centre. I wasn’t sure what to expect, but I was excited at the prospect of seeing the band again, and hearing the old songs. I bought a copy of the Newcastle Evening Chronicle on my way across to Carlisle, as it contained a feature about the end of Lindisfarne. The Sands Centre is a medium size venue and leisure centre just outside the centre of Carlisle. There was no support act, with Lindisfarne playing the entire concert, with an interval. The “new” line-up of the band was much better than I had expected and vocalists Billy Mitchell and Dave Hull-Denholm managed to recreate the old tunes in a way which gave them fresh life, but also remained true to the original. The set comprised all the old favourites: ‘Lady Eleanor’, ‘Meet Me on the Corner’, ‘Winter Song’ as beautiful and haunting as ever, Run For Home’, Fog on the Tyne’ and the encore was ‘Clear White Light’, just like the old days. There were quite a few newer numbers which I didn’t recognise. It was just great, and I was so pleased that I made the effort to see the band one last time. The audience were quite subdued, which I am sure was not the case at the final Newcastle gig. 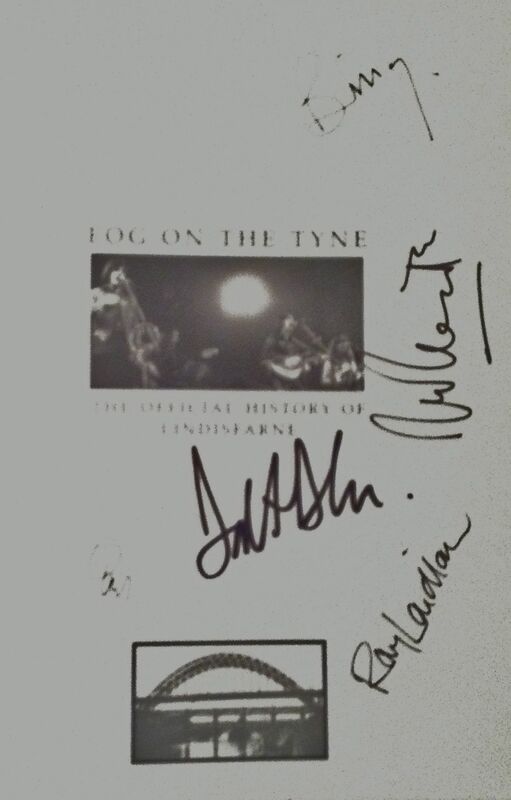 On the way out the band were signing autographs, so I got them to sign my copy of the Evening Chronicle, and I bought a copy of the Lindisfarne book, Fog On The Tyne, picture here, which they also kindly signed for me. Their final concert was filmed and released as a DVD, ‘Time Gentlemen Please’. The track listing is: No Time To Lose; Rocking Chair; This Guitar Never Lies; Remember Tomorrow; This Too Will Pass; Freedom Square; Ghost In Blue Suede Shoes; Lady Eleanor; Under The Promenade; Rock’n’Roll Phone; Statues And Liberties; Meet Me On The Corner; Born At The Right Time; Winter Song; Can’t Do Right For Doing Wrong; January Song; One Day; Road To Kingdom Come; Unmarked Car; Jubilee Corner; Unfinished Business; Whisky Highway; Run For Home; One More Bottle Of Wine; Fog On The Tyne; Devil Of The North; Clear White Light. That concludes my ramblings on Lindisfarne, at least for now. 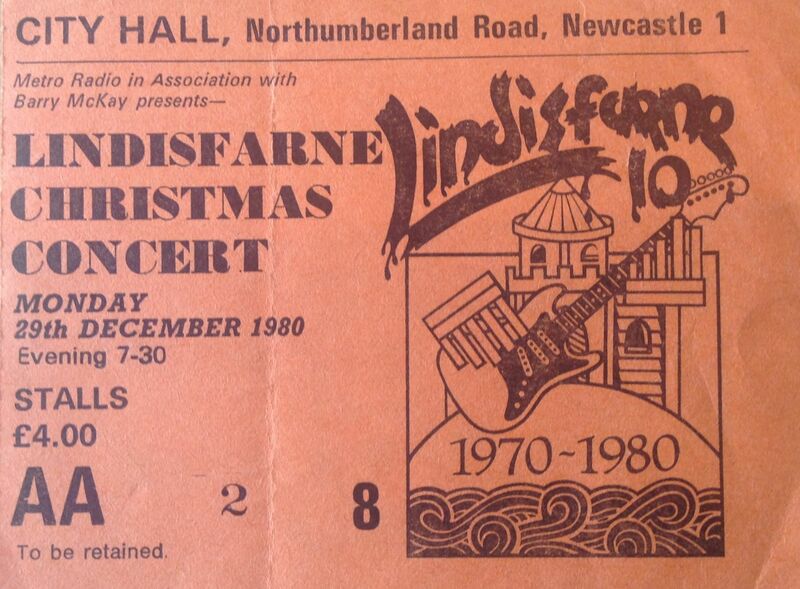 The Lindisfarne Christmas concerts became annual events from 1976 onwards. I went along for several years, joining in the festive celebrations. The concerts were immensely successful with the band playing for multiple nights at the venue to satisfy demand, and fans travelling from far and wide. In total the band performed 132 shows at Newcastle City Hall. 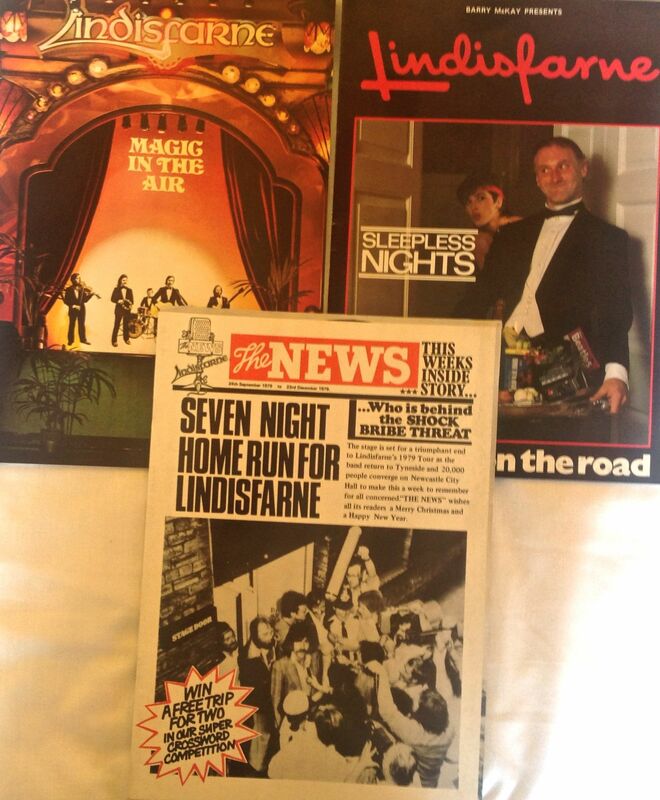 However, as time went on what started as great fun concerts started to lose their magic, at least for me. It was just getting too routine, and too much like going to the pantomime. I’m afraid I began to lose faith, and 1982 was the last year that I attended. Looking back through the programmes today I notice that Chas and Dave, Chris Rea, Maxie and Mitch and Mike Elliott all get mentioned as support acts. 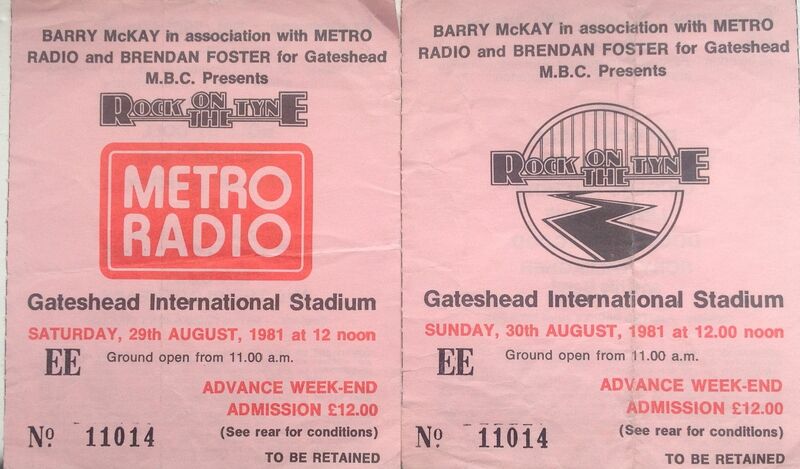 I aslo saw the band perform at the Rock on the Tyne Festival and supporting Bob Dylan at St James Park in 1984. The band were still fun to see, but over the years they seemed to lose some of the magic that was there in those early days. The Christmas concerts continued for several years, until 1990 I think.